I gotta admit, I'm a little behind on my Google Reader. I have more subscriptions on there than I care to count, all of them organized into neat folders: Beauty, Crafts, Cute, Design, Food, Friends' Sites, Funny, Geeky, Hollywood, Ladyblogs, Music, News, Productivity and Organization, Fashion and Shopping, Local, TV... Unfortunately, nearly all of them are in bold, with the number of unread items in each in parentheses right next to the name. But thankfully, even though I still have many posts left unread, I have eagle-eyed readers to let me know when I'm missing something good! A few days ago, reader Kara pointed me in the direction of our adopted big sister site, Design*Sponge. (I don't know that Grace knows I've adopted her in my mind 'cause I look up to her so much, but that's okay.) Design*Sponge featured this really cool grill that I swear is a combo of the mini-grills and the flower boxes I posted earlier this summer. You can find the Altan Grill on the site DesignDelicatessen... which, unfortunately, is in Danish. Still, the premise is pretty simple: hang the grill like you would a flower box, then fire away! I'd be careful about what kind of railing I would put this on, but I'm sure they have instructions about that kind of thing. (Anyone speak Danish and willing to take a look for us?) I was also able to glean that this retails for $83 US, so if you're a grillmaster stuck in a tiny apartment, longing for BBQ days of yore, this seems like a reasonable investment. Personally, I think anytime-you-want-'em s'mores are worth it. Via Design*Sponge and Design Delicatessen, and special thanks to Kara! "Few have a balcony room for a classic barbecue on legs. 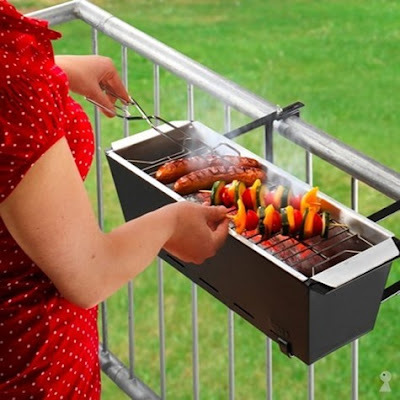 Simply hook Bruce - the space-saving balcony grill - onto the balcony railing. This allows everyone to barbecue - either they have a small balcony, or no balcony at all. Embellish Bruce with a pair of beautiful, large hanging plants in watertight pots when no-one is barbecuing or 'hide' the barbecue with the supplied lid." When you date a guy, you date his apartment too.